It's certainly a good time to be in the market for a new flagship Android device, isn't it? Amazon is selling the Motorola Droid 2 for just $.01, and the HTC EVO 4G and Samsung Epic 4G for a cool $100. Lately, Amazon and Costco have been in a price war over the T-Mobile G2; Costco struck first, dropping the upgrade price to just $100 - to which Amazon replied by dropping the new contract price to $80. Now Costco has shot back by lowering their own new contract price to just $50 without any rebate. Unfortunately, the upgrade and add-a-line prices are still $100 after $50 MIR. 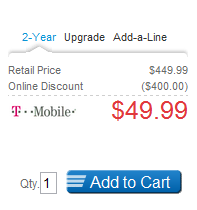 Fortunately, that's still a hell of a lot less than Amazon's $200 upgrade price. Also noteworthy: free shipping and no activation fee.